So today I got a surprise visit from my Fedex guy...he dropped off a package from YESto which sells skincare products. Recently I purchased the YESto Carrots C Me Smile Lip Butter because I have been trying to find a lip product for my dry, cracked, and sore lips. I've tried a few other things like MAC's Lip Conditioner, Bert's Bee chapsticks, and others but they don't seem to endure very long and I end up with cracked lips again making it difficult to wear lipstick without it looking terrible. (Just as side note I originally saw these products reviewed by Nat Neagle which is why I decided to try out the Lip Butter) I'm still trying the balm out as I've only had it about a week and half but already I can say it's making a difference and my lips already look smoother as well as feel better. I will finish this review once I've had a chance to wear it for a while longer and let you all know what I think! 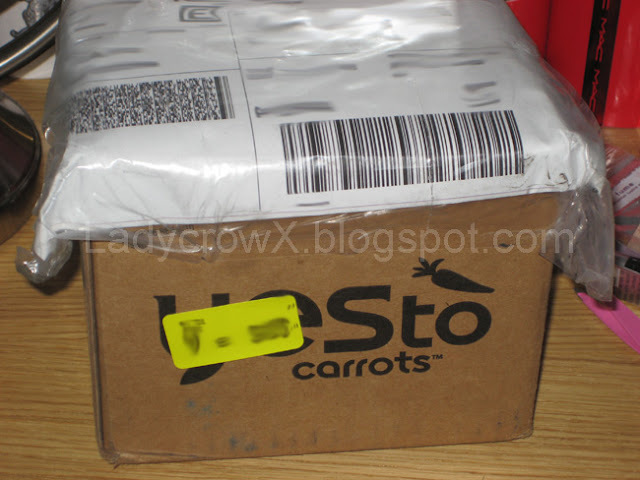 Note: These products were sent to me for review I did however buy my current YESto Carrots C Me Smile Lip Butter. I've been using the Yes to Carrots eye contour cream for over a year, and I absolutely love it! I really wanna try out other products in the line, especially since I'm gonna be out of moisturizer soon. Let us know what you think of the products soon! I've been in love with their C Me Shine lipgloss for over a year now. It doesn't have a strong smell or taste but it leaves your lips feeling soothed and isn't plastic-flavored. I have the Rose Bliss shade. I've also used their lip butter in mint and I love that, too. I hope all that stuff works out for you. I haven't used too many of their products but I've heard good things. I use the Yesto Cucumber wipes and I LOVE them. I've tried the Yes to Carrots face scrub and really liked it. It seems like the Yes To products are nice. wow, i've never tried them, i've never seen them where i live. love to hear your review soon! Porcelaine, I dunno why but for some reason I thought they made it in Australia? I thought that's an Australian company.